Not satisfied with the usual wine-and-cheese type of art event, emerging artists of the Visual Arts program at UBC's Okanagan campus will present their work during a public exhibition that will feature live entertainment, refreshments and a lively, eclectic atmosphere. Among the Okanagan's premier annual art events, the UBC Okanagan BFA Graduate Exhibition -- this year entitled INTUIT -- will see local collectors and art-lovers gathering to scout the works of developing young artists in the community. The opening reception takes place Saturday, April 17, at 6 p.m. in the Fine Arts and Health Building. The exhibit will run from April 19 to 24, from 9 a.m. to 4 p.m. Admission to both the reception and exhibition is free. 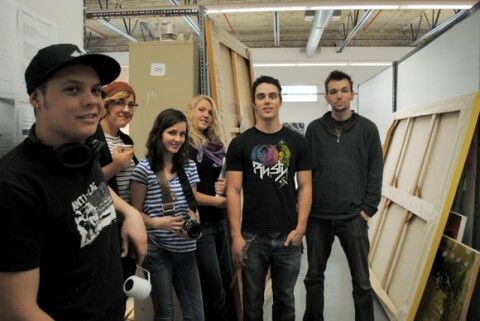 "The Okanagan arts scene is extremely rich and varied," says Cory Dixon, a student organizer with the exhibition. "The university is a unique space to bring together artists and art-lovers from all over -- grass roots to black-tie -- and really showcase Okanagan arts and culture." Musical headliners showcased at INTUIT include preeminent Jazz talent Anna Jacyszn, Bernie Addington, the host of Kelowna's Jazz Café on double bass, and Neville Bowman on piano. Following these are Walking Contradictions, a folksy duo from Kelowna, Vernon's Poor Little Rich Girl, Tree Lines and thrash punk band Cities Ablaze. Visitors and patrons will also hear from UBC Okanagan's spoken-word poets as they introduce each band. A number of the graduating students' art pieces on display at the BFA Graduate Exhibition will join the UBC Okanagan Public Art Collection, which consists of about 230 pieces ranging from paintings, drawings, video works, photos, prints, sculptures and an array of media. Most of the works are on display throughout the six main buildings on campus. "It is most important to have a Public Art Collection," says collection curator Susan Belton. "It enriches our campus visually and enlivens the academic experience. It makes our institution a unique place, broadening cultural horizons and deepening historical understanding." The Public Art Collection also features works from a number of renowned artists, such as Governor General's Award-winners Carl Beam and Nobuo Kubota, as well as works from professional artists Ann Kipling, Anna Coughlin and a number of Inuit artists, including Order of Canada recipient Helen Kalvak. "With each new piece, we grow our collection, we increase its value and we provide opportunity for students, faculty, staff, alumni and visitors to expand their appreciation and understanding of art," Belton says. The complete Public Art Collection at UBC Okanagan can be viewed online at http://gallery.ok.ubc.ca/pac.